To explain what Taberu Rayu (食べるラー油) is, I really have to back up and explain what rayu is. Rayu is sesame oil that has been infused with chilies until it is a nice glowing orange-red. It is delicious mixed with vinegar and soy sauce as a dip for gyoza and often seen in ramen shops that serve dumplings. Taberu Rayu, on the other hand, starts with that same hot chili oil base, but it has crunchy bits in it. Minced fried garlic, fried onion bits, sesame seeds, even bits of almonds are included for a chunky crunchy condiment that can be spooned or mixed into just about anything. On top of ramen, spooned on a bowl of plain rice, even outlandish ideas like putting it on ice cream have surfaced in Japan. Despite it being relatively new, debuting in Japan around 2009 (even though Chinese chunky chili oils have been around forever), this condiment has tons of variants and uses. It's like a secret weapon to add a savory spicy and crunchy aspect to any dish with no effort. It has become very popular in Japan, and has many varieties such as a reduced oil (and therefore calorie) version and some that include dried shrimp. 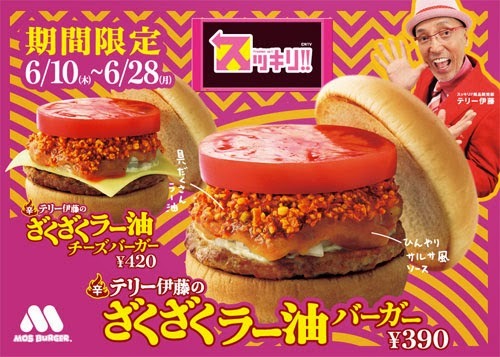 Mos Burger, a Japanese fast-food chain of burgers, even featured a taberu rayu burger as a special item as seen in the advertisement above. It looks so tasty I might need to recreate it for this blog! This addictive condiment is available in any Japanese grocery store like Mitsuwa or Marukai, but you can also make it at home. Here's a version by Shizuoka Gourmet that also has dried shrimp in it. Some quick ideas for using Taberu Rayu: Spooned onto rice, a heaping spoonful into instant ramen, mixed into an omelet, even drizzled on pizza!